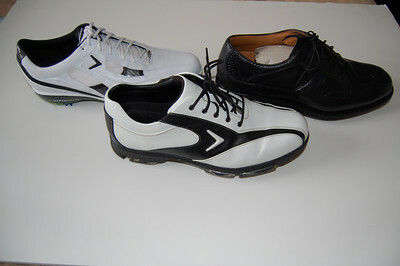 Last year The Hackers Paradise had the opportunity to review the Callaway Sport Era golf shoes. Despite a few issues we thought they were a great buy for the bargain price they were available at. The new year brought quite a few new styles and THP was thrilled when Callaway sent us a few pairs to take a look at. They sent us a pair from three of their Men’s lines. Each line has different characteristics in both aesthetics and feel. We will cover each series in this profile and let you know about style, comfort, durability, and our overall thoughts. 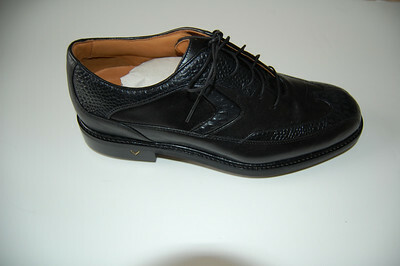 The Callaway Tour Authentic Exotic Chev has classic wingtip styling enhanced with reptile textured leather. Tour performance with enhanced stability and comfort. Last year we had some issues with the spikes of the Tour Authentics but they seemed to have fixed that issue. The shoe is extremely comfortable and in the rounds we played, found that there was zero foot fatigue. With a price of around $190, we found them in line or even a little cheaper than most of the other tour quality shoes that we have tried. The Callaway XTT Comp is one thing we did not expect in this mix. European influenced design with the newest in cutting edge traction technology. The XTT Comp is built for comfort, stability and performance for the demanding golfer. The first thing you notice with this shoe line is the aesthetics. They jump out and look different than anything Callaway has done in the past. However they still kept it extremely simple and these will not alienate even the most traditional fans of the game. Sharp lines and traditional colors make it a star in the making carrying a price tag of about $150. Xtra Width Technology (XWT) provides the player the ability to adjust and customize fit. This system allows each golfer to adjust his or her individual fit from medium to wide for each shoe–by simply adding or removing one of the unique XWT forefoot layers from the insole. Xtra Width Technology also allows the user to adjust the fit between the left and right shoe depending upon the length and fit difference of the feet. Does it work? It works very well and for someone like me that is slightly different in both my feet it may be an absolute blessing. These felt great on the course and overall we thought they were the best pair we tried out of the line. A shoe that not only looks great but is practically custom fit for your foot, we couldn’t have been happier. The last pair in this review also features the XWT system that we spoke so highly of before. The Callaway Hyperbolic Tour golf shoe carries a price tag of $180 and is engineered with the same lightweight materials used in football, soccer and basketball, these shoes provide premium athletic performance. On the course I found these extremely comfortable and they worked quite well. The shoe had more breathability than the other two pairs which was something I was not acustomed to. I quickly got used to this new feature and found that in the Florida heat it felt great. My only real issue with these shoes is purely aesthetic. I love the great colors on the bottom of the shoes, such a green and blue, I would like to see more color options like this available for this shoe model. It seems to be the model that could incorporate some reds, blues, and greens in them. 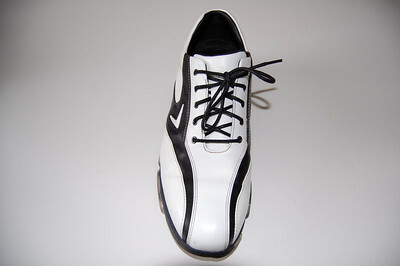 However this is purely preference and the black and white pair we received are very good looking. 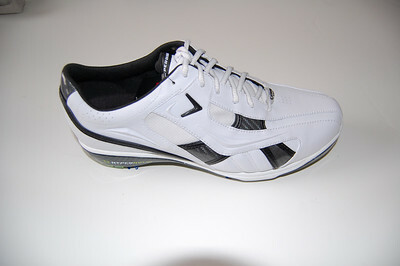 Overall we were pleasantly surprised by the Callaway line of golf shoes. We had some issues with last year’s line and all of those minor complaints we had have been corrected. The stability we received while wearing any one of these pairs was second to none and they even added some pizazz with the XTT. The XWT that we learned about in reviewing these is about as good as anything we have come across in standard soles. For anybody in the market for new golf shoes and wants a shoe that has tons of technology backed with great comfort, then the Callaway line has to be taken seriously. For more information on Callaway Golf products check out their website at www.callawaygolf.com. 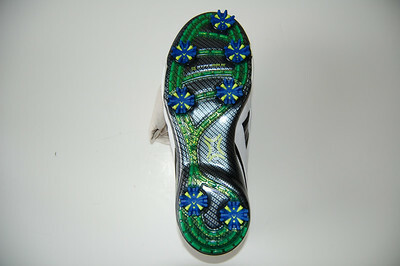 Great review, I wasn’t a fan of Callaway shoes but the XTT Comp could change that. I really like the adjustable insoles aspect of the shoe. Good write up. I too was not fond of their offerings last year, but this year they seem like they turned it around. I love the idea of adjustable shoes, I think that is just great! I agree about adding more colors. I think the traditional look is nice but every now and then you have to tap into your wild side and try out some colors : ) Great review JB!! I could probably go for a new pair of shoes this year but at these prices (for me) I could probably buy two pairs of something a little cheaper! 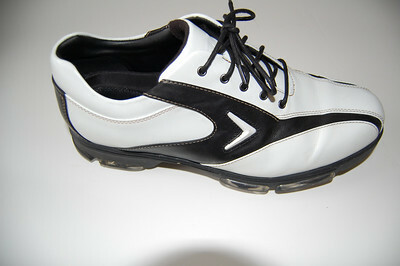 I have a pair of ladies Callaway shoes, but their price tag was less. (I got them as a tee gift at a member guest tourney). I think they retailed for $90-ish. I never wear them. Cool looking shoes!! Although I’m tempted, I’ll be sticking with my Eccos.